The area around Constable Point, Liverpool Land and the Stauning Alps has a thriving population of polar bears. The local village of Ittoqqortoormiit has some registered hunters who are allowed to hunt a small quota of polar bears each year, using traditional dog sled teams. Polar bears tend to hunt around the edge of the sea ice in winter, and stay fairly coastal in summer. 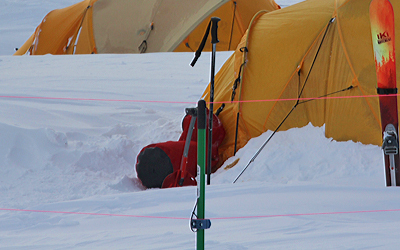 Expeditions that are camping or travelling in coastal areas have quite a high chance of seeing a polar bear. All expeditions use appropriate polar bear defence. Each camp will be surrounded by a polar bear fence. This is a tripwire system that will set off a high pitched alarm, alerting the camp's inhabitants before the bear gets too close. You'll be shown how to put this fence up and briefed in what to do if it goes off in the night. Each expedition carries several types of flares and a rifle. Mini-flares are used if a bear is still far away, to send a small, noisy and bright projectile in its direction and scare it away. If this fails, hand flares shoot out a flame and are used in closer quarters. Each group will also have a rifle. This is a last resort for an aggressive bear - no Tangent group has ever had to shoot a bear. 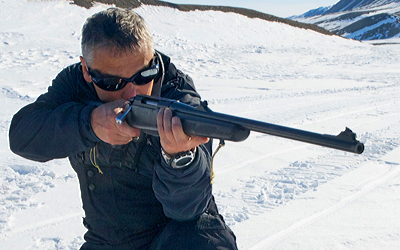 Your guide will give you flares and rifle training when you arrive in Greenland. For those expeditions camping in locations where the chance of a bear encounter is high, a bear watch system will be used throughout the night. Each member of the team will take it in turn to stay awake for an hour or so, sitting outside to keep an eye out for any bears. This is made easier by 24 hour daylight from April onwards! 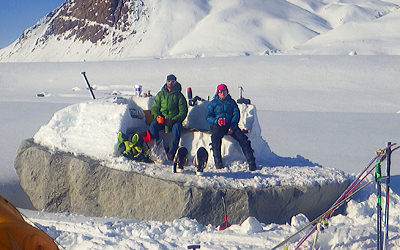 Previous Tangent clients have found this to be a great chance to enjoy some moments of solitude on a busy expedition.